Golf Lesson Gift Certificates are easy and can be emailed to use in a matter of minutes. Just call 905 533-1330 or email sandrapost@rogers.com. They make great Christmas gifts! Each personalized coaching session will comprise 60 minutes of work on the range and on the course. I suggest you come early and warm up with a bucket of balls which is included in your lesson. After working on the range or in the short game area for approximately 30 minutes we will take you on the course and see how your game moves from the range to the course. If you are interested in learning to golf properly with good basics – grip, stance, posture, and alignment – in a professional but stress-free environment, we recommend this session. The golf swing is taught in a simple manner with drills. Students will hit irons, hybrids, fairway woods and the driver. The Short Game (putting and chipping) will also be covered. In addition, you will play on a private 4-hole course located at Glen Eagle. It is important to us that you are comfortable making the transition from range to the golf course. 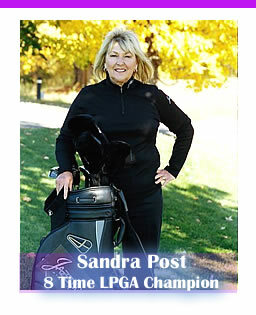 During the last hour of the session, you will be on course with Sandra where you will learn golf terms such as scramble (best ball format), the pace of play, continuous putting, ready-golf, as well as some simple rules and etiquette. If you do not have your own clubs, this class includes golf clubs for your use. THIS IS A GREAT INTRODUCTORY CLASS COMPRISED OF 4 HOURS OF GOLF INSTRUCTION. For the golfer who has advanced past the beginner stage but has not reached the Advanced Clinic Level. A level 2 golfer is one who currently plays, keeps score and shoots between 100-120. We start this class in the Short Game area of Glen Eagle Golf and Country Club and cover Short Game. From there we will head to the Long Game area and start with stretching exercises. We will review the grip, stance, posture, alignment and set up. We use drills to help you review the various segments of the swing. See below for schedules. These intense hitting sessions are a great way to start the season, review the basics plus bring your game to the next level. Remember to take advantage of our short game bonus please arrive 15 minutes before the scheduled classes. If you have your own group of 4 please call as soon as you can so we accommodate your date request. 4 students maximum, 2 hrs. In putting, we explain the stroke, review the basics, stance, posture, try different grips and check the length of your putter to see if it is the correct fit. From off the green, we cover chipping and pitching. We explain the pitching wedge, gap wedge, sand wedge, lob wedge and playing percentage shots. We work on our sand play. This class is conducted in the Short Game area at Glen Eagle. This is a short game area that has it all. Take strokes off your score with quality practice and with a short game class that is easy to understand. You are encouraged to arrive early for your class or stay after the session and practice at the Glen Eagle short game area. This is a fast paced class that is fun and full of quality information. Regardless of your level of play, this class will help you with “the scoring part of the game”. The private coaching lesson is a one on one experience. If time does not allow to take a clinic, or you want to work on a specific part of your game, then the coaching session is the way to go. They are 60 minutes in length and you can work on any aspect of your game. The semi-private lesson is an hour in length. This lesson consists of two students and one instructor. To maximize learning, both golfers should be of likeability and it is up to you to provide both golfers. Any aspect of the game can be worked on and tailored to suit your own needs. Please refer to the rate schedule above for individual instructor rates.